Bhutan inspirational tour is to reach isolated regions and encounter unique lifestyles. Less comfort but more tales to tell! Drive to Thimphu (1 hr) and up to the huge Buddha statue with a great view over the city. Visit the Folk Heritage Museum to get an idea of life in an ancient Bhutanese farmhouse. At the Institute for the 13 Traditional Arts (ZorigChusum) students learn one of 13 skills such as statue-making, Buddhist painting or silk embroidery. If you are interested in traditional herbal-based medicine you can choose to visit the Institute of Traditional Medicine. Alternatively, at the Textile Museum you will learn about the intricate silk weaving which is very much a part of Bhutanese culture. Finally, visit the impressive Thimphu Dzong (Trashichodzong) which is a fortress-like building housing important offices of both the government and the monastic body as well as a number of temples. Dinner in one of our favourite restaurants in the city. In the afternoon visit the Chang-gangkha Temple, where locals take their children to be named. Drive up to the Takin Reserve to see the national animal. Archery is the national sport of the Bhutanese so spend some time at the archery ground today where you are sure to find some archers honing their skills. Enjoy some free time browsing in the small capital city. We suggest a visit to the Post office museum to see the stamp collection or to make your very own stamp and a visit to the handmade paper workshop or the various weaving centres.Finally, take a stroll around the Memorial Chorten where you will meet people of all walks of life circumambulating the stupa. Drive to Punakha (2½hrs). A one-hour drive from Thimphu brings you to the Dochula Pass at an altitude of 3,000m. Stop to circumabulate the 108 chorten and enjoy the view of the Himalayan peaks in the distance. Then descend to 1,200m and visit Chimi Lhakhang, the temple of 15th Century Lam Drukpa Kuenley, also known as the “Divine Madman”. Continue towards Punakha Dzong, which was the former fortress capital of Bhutan. The monks live here during the winter months, moving from their cooler summer residence in Thimphu Dzong.For those who enjoy village walks and hiking, we have a choice of two wonderful walking tours that you can opt for today. DRIVE TO TRONGSA WINDING ROADS AND A WATCHTOWER MUSEUM. of 2,900 metres. The Ogyen Choling palace is an interesting living museum of life in feudal Bhutan. It’s one of our favourites. After lunch in a local guesthouse, return to Jakar and visit Lake Mebartsho, en route. This is a deep pool in a steep gorge so you must follow your guide’s instructions carefully. 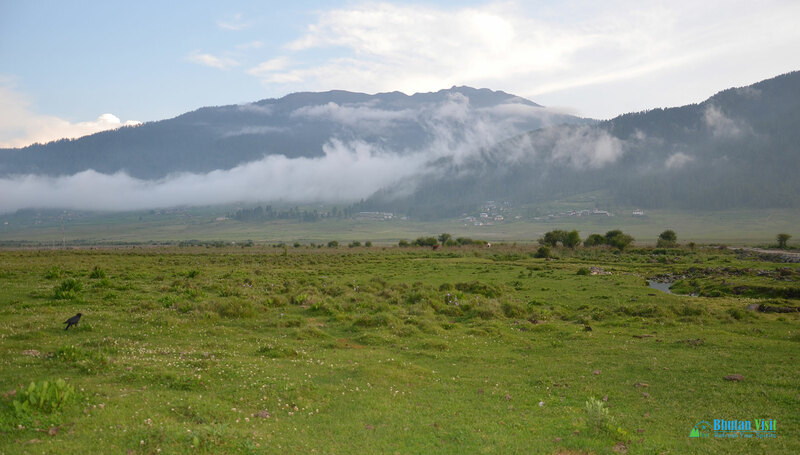 It is a site of pilgrimage where Pema Lingpa, a local saint and “treasure-revealer” emerged from the lake with a burning butter lamp in his hand. Alternative excursions to Ura village or some hiking options to Kunzangdrak or Tharpaling are also available. You may also wish to stay overnight in the valley but please note that the accommodation is in a simple guesthouse. DRIVE FROM BUMTHANG TO MONGAR (5- 7 HRS). Today set out towards the lesser-visited regions in the east, crossing Thrumshing-la pass at 3,900m and driving along more winding roads, with towering rock faces at places. The drive will take about 6 hours, with stops en route. Stop to visit Ura village, a unique village for Bhutan with the houses all grouped together. The variation in altitudes is quite largetoday. The route takes you up to 3,900m and down to about 700m where you will find oranges, bananas and other fruit trees, before you finally reach Mongar town. Mongar, where you will stay tonight has grown into a fairly large town. Please be aware that all the hotels in the east of Bhutan are much simpler than in the west. DRIVE TO TRASHIGANG (3½ hrs). Trashigang is a small town with an imposing dzong perched high on the cliff. Stop for a stroll around the small town. Later, drive to Ranjung monastery, about 16km from Trashigang town and visit some villages in the region. Morning drive to Trashiyangtse (77 Km) where the main attraction is the impressive Chorten Kora which resembles Bodhinath of Nepal. The stupa is at the centre of life in the region and is the location for the spring festivals that draw people from as far as Merak and even Arunachal Pradesh. The inhabitants of this valley produce wooden bowls and other wood crafts. Before reaching Trashiyangtse town, visit theInstitute for the 13 Traditional Crafts, which is the sister of the Zorig Chusum Institute in Thimphu.Later, hike/drive towards Bumdeling. (2½ hrs or more). At certain times of the year the road may not be in a good enough condition to drive. Bumdeling is the winter home of the rare black-necked crane that arrives from Tibet in November and stays until March. It is a beautiful rural setting so nice for a leisurely walk along the river and through the rice fields. Many of the villagers make paper and set it out to dry on small wooden frames outside their homes. Please be aware that the hotel in Tashiyangtse is very simple. The Chorten Kora festival takes place in Trashiyangtse. The Gom Kora festival is on the way towards Monagar.If attending the Gom Kora festival for most of the day, an early start is required. Drive from Trashiyangtse back along the river. This is a special pilgrimage sites where Guru Rimpoche meditated before going to Taktsang (Tiger’s Nest). In the process of subduing a demon that had followed him all the way from Tibet, he made a hole right through the rock. The temple was built at this spot. The Gom Kora “tshechu” festival consists of masked dances performed by monks and laymen and all the pilgrims will circumambulate the sacred cave and temple. Many of the semi-nomadic people of Merak and Sakten attend both festivals as a highlight of their year. Continue on the return drive to Mongar. MONGAR TO BUMTHANG (6 – 7 hours). Early morning drive from Mongar to Bumthang. Today will be spent mostly driving but with many opportunities to stop and stretch your legs along the route. Drive to Phobjikha, a wide, high glacial valley. Visit Gangtey Monastery the only Nyingma monastery in western Bhutan (most Nyingma monasteries are in the eastern part of Bhutan). A stroll through the village is sure to end in an encounter with the localvillage children who are always curious to see you. Hike or horse ride to Taktsang temple, also known as the Tiger’s Nest, which is built into the sheer rock face at an altitude of 3,000 meters. This is a highlight of the tour and involves a 2-hour uphill hike. The visit to the temple, and the return downhill to the base makes this a 4-hour round trip. This hike requires a certain level of fitness but is not excessively difficult.In the afternoon drive towards the ruined fortress Drugyel Dzong from where you can get a view of the distant Jhomolhari mountain and enjoy the rural scenery of the valley with its small villages and farms scattered here and there. On the return to town, visit Kyichu Lakhang, one of the oldest temples in Bhutan. You may wish to book a massage at one of several hotel spas to relax after your hike.